We welcome new advertiser Bang Bang Boutique to the lineup of women-friendly advertisers that support the concept of offering “news and reviews and stories about you” — the outdoorswoman — here at The WON. Meet Kimberly Bortz, proprietor of Bang Bang Boutique. 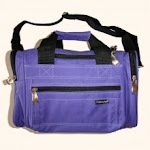 Three Peaks range bag comes in purple, pink, black, navy blue or hunter green. The availability of range gear for women is what sparked the idea for Bang Bang Boutique. Having the right range bag was very important to me as a new shooter, so the store carries a variety of range bags that are affordable. The Three Peaks small range bags in pink, purple, black, navy and green are just the right size for ladies who may have only one or two hand guns. For women who need more room, KNJ’s larger tactical bags, such as the Deluxe Range Bag, are another option. 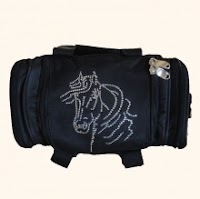 Additionally, BBB can customize any range bags with a rhinestone design or monogram. For concealed carry, we offer holsters and purses. We carry the innovative Flashbang Holster, which attaches securely and discretely to your bra. It is constructed out of Kydex and comes with three different size leather straps to attach to it depending on the bra being worn. The Kydex is a clamshell design allowing for a fast and easy draw, while being totally secure when worn as it was designed to be worn. Flashbang holster sold at Bang Bang. Other concealment options offered are pocket holsters, ankle holsters and belly bands made by KNJ manufacturing. I’m always on the look out for other concealed carry holsters that best fit women’s needs. I’m a strong believer that women should be able to keep maintain their fashion preferences while carrying a gun. One of many in the lineup from Gun Tote'n Mamas! Bang Bang Boutique carries purses by Gun Toten’ Mamas – including newly released styles. These purses are not only affordable, they are well made and fashionable. With models such as the zebra print hobo or red leather traditional open tote, all you see is a beautiful purse and no one would suspect there is a gun hidden inside. Protective Eye wear is another area that can pose a challenge for female shooters. Mainstream shooting glasses are masculine and not designed to fit smaller faces. Bang Bang Boutique carries safety glasses that are ANSI z87.1-2003 compliant, in feminine styles and smaller fits. The most popular model is the Cougar which comes in three shades of pink an in either clear or smoke lenses. Women with smaller faces struggling with fit enjoy the Player and Geneva models. Other frames offer more style appeal featuring tortoise shell frames and one with rhinestone accents. All come with a microfiber storage pouch. Bang Bang Boutique also offers hearing protection. The most popular earmuff is the Browning Hearing Protector For Her which is NRR31. For earplugs, the Super Leight Women NRR30 in hot pink are a best seller. The are made for smaller ears. For ladies who want something in between, we have the Ultra Light Sound Sensing Hearing Protection by Allen which are banded earplugs. Kimberly Bortz, on the range. Recently added are the KNJ belt holsters which are available in patterns (zebra, leopard, pink leopard and purple leopard) as well as in solid colors (pink, purple and black). To go with the holster is the nylon web holster belt which comes in pink, black, foliage green and khaki. Bang Bang Boutique offers pre made Range Kits which include a bag, hearing protection, shooting glasses and a hat or other extras. Bundled together it is a great value, plus you get everything you need in one stop. This is a great gift idea for a lady who is just getting her first firearm! For when the firearm is not in use, Bang Bang Boutique provides a variety of cases that will fit your pistols, shotguns, riffles and larger assault weapons. Many of the cases are available in patterns and multiple colors. Customize it! Add bling or whatever to your own bag. Bang’s Signature features items that have been customized with rhinestone or Swarovski crystal accents for the lady who really wants her firearm accessories to stand out. Besides what is offered in this section, a customer can make a special design request by filling out the customization request form. A newly added feature is the “Bang of the Week” which is a featured discount. The discount may be something already offered in the store – or it may be another firearm accessory offered at a special price. In April 2012, there will be a new line of range bags exclusive to the site.